The large, controversial shuttle buses that ferry technology workers to and from San Francisco are here to stay. San Francisco Municipal Transportation Agency's (SFMTA) board of directors approved a permanent version of the Commuter Shuttle Program on Tuesday. The program will start Feb. 1, 2016 and will include a number of tighter regulations for the shuttles, including limiting larger buses to approved main roads, charging a per-stop fee and increasing enforcement from the city. The buses have become a symbol of the city's ongoing struggle with gentrification and soaring housing costs. 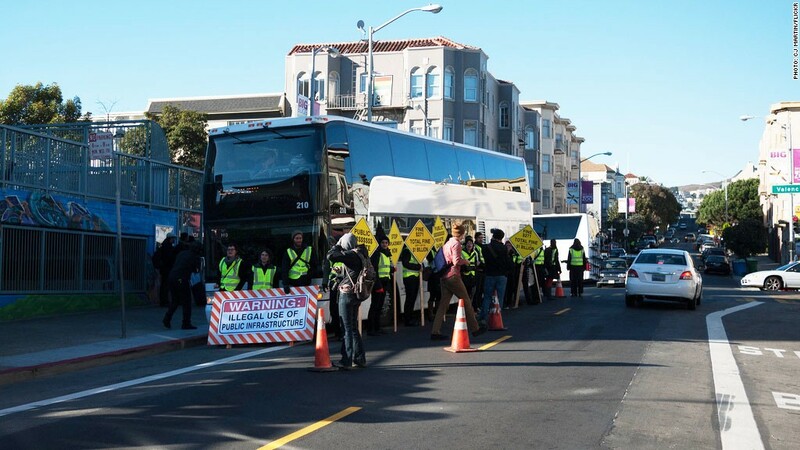 In late 2013, protesters began targeting the buses, which were operating without much oversight in the city, making unauthorized use of MUNI bus stops. Often dubbed "Google Buses," the shuttles are actually provided by a number of large tech companies including Apple, Facebook and Yahoo. They are typically owned and staffed by third-party transportation companies. Protesters complained that the double-decker buses were loud, dangerous and disruptive. They blamed passengers, typically younger well-paid tech workers, for driving up rents in an already expensive city, and pushing out lower-income residents. "The notion that shuttles are causing gentrification ... is simply not connected to the data that we have," said SF Board of Supervisors member Scott Weiner at the hearing. "Whether or not they have access to shuttles, they're going to live here." To address the issues, the SFMTA started a pilot program in August 2014. It cracked down on where the buses were allowed to stop, set up new rules for drivers and measured the impact of the shuttles on the community. The SFMTA released its first report on the program in October. It determined around 8,500 people use the shuttles for round-trip transportation every day. Surveys found 47% of riders would drive to work without the shuttles, and 45% didn't even own cars. Those findings supported the biggest argument for the shuttles, that they decrease traffic and pollution. "We look forward to keeping thousands of cars off the road and minimizing the impact of shuttles on San Francisco's streets," said a Google spokesperson in a statement. The program was approved by the board after nearly two hours of comments from the public. Citizens who live near shuttle routes, tech workers who rely on the buses, a number of union representatives and a former San Francisco mayoral candidate lined up to voice their opinions on the program. Many residents asked for additional changes to address issues like noise, damage to their roads and safety. "Make my employer pay more," said one tech worker, who uses the shuttles for his commute. A state law limits the amount of money tech companies pay to the city, and the program's final fee has not yet been determined. During the pilot program, shuttles paid $3.67 for each pick-up or drop-off stop. "I am against the invasion of these overgrown mechanical hippopotamus buses," said local Herbert Weiner. "It's turning the city into a glorified industrial park and it's a bad science fiction movie." Eric Williams, the head of the local bus drivers' union, said nobody from the pilot program contacted his drivers to get input on the shuttles. "I think that this city is undergoing tremendous transformation," said board member Joél Ramos before the vote. "The issue of gentrification and affordable housing is an important issue that is related to transportation, but the issue that we're seeing with these shuttles... it's more a symptom, and this policy is not the place to deal with it."